EXCLUSIVE – Nearly 60,000 immigrants with arrest records — including 10 accused of murder — have been allowed to stay in the United States under the Obama-era Deferred Action for Childhood Arrivals (DACA) program, the Department of Homeland Security (DHS) revealed Monday. Francis Cissna, U.S. 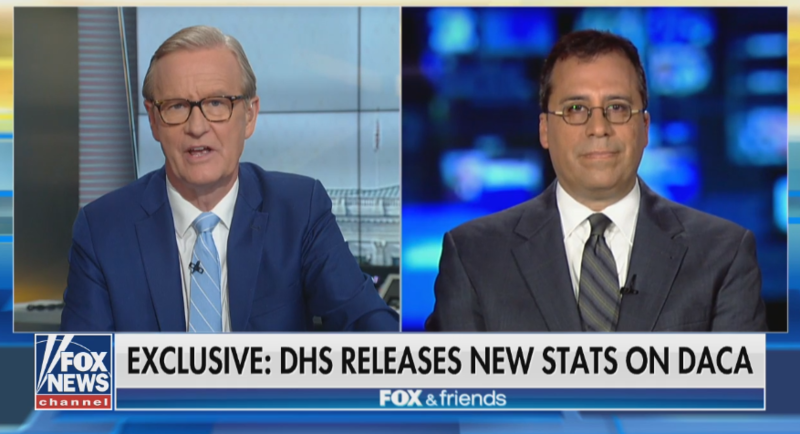 Citizenship and Immigration Services (USCIS) Director, told “Fox & Friends” the agency wants to release as much data about DACA as possible for the public and lawmakers to be informed. “I would like people to keep in mind…whatever they do, I would hope that we, at USCIS, would be able to turn down these people…if we think they’re a public safety threat…if someone is a gang member…even if they don’t have a conviction,” Cissna said. Approximately 38.9 percent of the DACA recipients with a “prior” arrest were accused of so-called “driving-related” offenses, excluding driving under the influence. Another 22.1 percent were accused of “immigration-related” crimes, while 12.3 percent were accused of theft and larceny. More than 4,600 DACA recipients have been accused “drug-related” crimes, again excluding driving under the influence. A DHS spokesman said the department was releasing the arrest data in response to inquiries from “from Congress and others” for more detailed information on DACA recipients, including DACA criminal activities. Under the terms of the program, immigrants are able to live and work in the U.S. for two years at a time before they must apply for a renewed “grant of deferred action.” DHS says convictions for felonies, “significant misdemeanors,” or at least three “non-significant misdemeanors” would “generally” result in removal from the program. The arrest data has been made public as Congress prepares to consider a pair of immigration bills put forward by Republicans that contain provisions aimed at helping immigrants brought illegally to the U.S. as children. The current version of one of the bills, penned by conservative Rep. Bob Goodlatte, R-Va., would extend DACA protections for renewable six-year periods. Recipients could later apply for permanent residency and eventually citizenship. An expanded number of children who arrived legally with parents who have obtained work visas would also be covered. President Trump announced this past September that he was ending the DACA program, though a series of federal court rulings has kept it functioning for the time being. Our ads say: Americans want to cut immigration. Why is Congress ignoring them?